In large saucepan bring water to a boil over high heat. Stir in potato slices. Boil 15 minutes. Stir in milk, contents of sauce packet from potatoes, ham, vegetables and mustard. Reduce heat to medium; cook and stir 4 to 5 minutes or until mixture is thoroughly heated and sauce is of desired consistency. A purchased mix of dried potatoes and sauce is a quick way to make scalloped potatoes The water must be at a full rolling boil to properly rehydrate the dried potatoes. 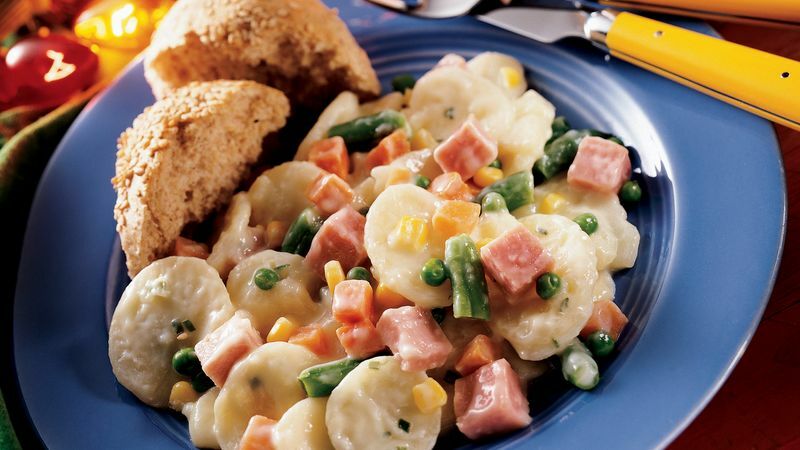 The little ones will love it if you use cut-up hot dogs and frozen corn in place of the ham and mixed vegetables. All you need to round out this one-dish meal is a crisp green salad and whole wheat bread or rolls.